Be among the first to get it. Lavender has a long reputation for its pleasant uplifting scent, its healing effect on the skin and its ability to nourish the hair and scalp. 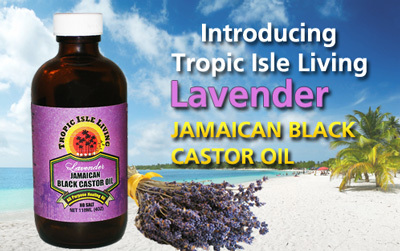 So for those of you who are looking for an enhanced relationship with our black castor oil, Tropic Isle Living has developed the Lavender Jamaican Black Castor Oil. This wonderful product is just as effective as Tropic Isle’s original Jamaican Black Castor Oil. It’s enhanced by the additional hair and skin benefits that pure and natural lavender essential oil possesses. You can also use it as a massage oil for aches and pains, or simply to rejuvinate your skin.